This is a great recipe when using cookie cutters. It doesnt spread! Your cookies will be the same shape after you bake them as they were before. Note that this recipe makes up to 8 dozen 3 cookies, but it is easy to cut in half. 1. Cream sugar and butter until fluffy, about 5 minutes. Add eggs and vanilla. Mix dry ingredients in separate bowl and add to butter mixture. Mix well. 2. Put a handful of the freshly made dough between two sheets of parchment paper and roll to desired thickness. Repeat with the rest of the dough. Put the rolled dough, including the parchment paper, on a cookie sheet and refrigerate for 10 minutes or longer. Your dough will be chilled and ready to cut and bake with no wait and no added flour! Repeat with scraps after cutting cookies. 3. Bake at 350° F for 8 -10 minutes. Let cool. Recipe makes 8 dozen 3″ cookies. This entry was posted in Baking Inspiration, Christmas Baking Ideas, Recipes & Tips and tagged sugar cookie recipe by Fancy Flours. Bookmark the permalink. Thank you for such a easy and wonderful recipe!!! It is the only sugar cookie I make now!!! Loved them, and when your dahing around, there so easy and quick and sooooo good! Merry X-mas! Thank you so much for this recipe. I had the perfect sugar cookie recipe but could never rely on them not spreading during baking. This recipe is truly perfect and taste just as great as they look! I tried these cookies for Valentine’s Day and they were fabulous! It’s true – they don’t lose their shape. I’ve tried at least a dozen recipes and this is the best by far. Thanks!! Thank you so much for this recipe!! I used it to make cookies for my uncles wedding last week, and everyone was raving about how good they were with the raspberry jam. Thank you! If you want to see how they turned out, come check out my blog, BITSY…the bakery and look at the wedding post!! Thank you again for this sugar cookies recipe. I finally did it for a second time and they looked and tasted great! I posted a recipe on my blog with this cookie recipe, although I reduced it to half and made a few changes in the steps, I did a link to you. You are welcome to visit my blog. I tried this recipe and it was way too dry and it would not roll out! Very upset about it and can’t seem to figure out why! This recipe is truly no fail, so there are only a few things that would result in the “dry” consistency. One is the egg size–did you use large eggs? If not, that may be the problem. The second thing isthe type of flour you used–all purpose flour is the best for this recipe. If you used higher protein bread flour, that will cause the dough to dry out. The last issue is the butter–you cannot substiture margarine or crisco in the recipe. If none of these ingredients is suspect, then you may be in a very dry part of the country–just add another egg and the recipe will come together nicely. I love your recipe. I made these cookies into Valentine lollipops for my son to give out instead of the paper cards and they were such a hit. I do believe these are never fail… My neice and son had a blast decorating them too. He is already asking to make them again. Great recipe! I just tried it and the cookies turned out wonderfully. I am a baker and had all but given up on being able to offer decorated cookies. My favorite sugar cookie recipes–as well as countless others that I have tried–resulted in great tasting cookies that were spread out and puffy beyond recognition once baked. These, on the other hand, retained their shape with my cutters, browned nicely and tasted great! And what a huge timesaver; I didn’t have to wait an hour for them to be ready to bake. Always hated that part about most recipes! Thanks so much! We love this recipe too. I use it all the time. The trick is to chill the dough before and after you cut out your cookies. I am so glad you liked it. I have made it with whole wheat flour and it turns out just as nicely. I made these cookies and forgot to add the baking powder and you know what they were as good as I made them the first with the baking powder. Great recipe. Check out my blog post on the butterfly cookies. Hope this helps. Happy Baking! So I did the converted grams recipe because it’s more accurate to weight measurements out, and it’s quicker. As soon as I added the flour I noticed right away something was wrong. It was way too dry and crumbly. So, I checked the math. At 4.41 oz per cup, 1379.5 grams of flour would equal 11 cups; 6 cups of flour is 750 grams. Is my math wrong? If it is, then I messed up somewhere. If it isn’t, then I’m pretty tangled over wasting a pound of butter and THREE pounds of flour. I want to try and make these, but I want to make some great frosting on them, do you have a recipe for that as well? • The secret to royal icing is in the consistency. Fortunately, royal icing is very forgiving. Does it seem to thick? Add a few drops of liquid at a time to thin it down. Is it too thin? Add a small amounts of confectioners’ sugar and stir until you get it thick enough. Makes 2 cups (usually enough for one batch of our No Fail Sugar Cookies. • Combine all ingredients in the bowl of an electric mixer fitted with the paddle attachment. Mix on low speed until smooth and creamy, about 7 to 10 minutes. If icing is too thick, add more water. If too thin, beat icing 2 to 3 minutes more. • Add a clear extract or flavored oil to make your frosting take on different flavors. We love lemon oil and almond oil. • Color icing with desired food colors by blending a drop of coloring into the icing. Gradually blend additional drops until you achieve the desired color. • For decorating sugar cookies you will want your icing consistency to be somewhere between heavy cream and ketchup. Not too thick that it won’t come out of your pastry bag or squeeze bottle, and not too thin that it rolls over the sides of your cookies. I love this recipe, and I always use it. However, I have never been able to get 8 dozen cookies from it! I think I max I have ever got was 6 dozen, and that rarely happens. 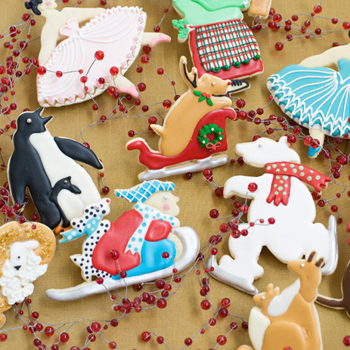 What size cookie cutter are you using? I’m looking to make sugar cookies that look like they have playdough in the middle–sugar cookie logs that are then sprinkled and cut. Would this be the right recipe to try for this or something else? Okay, so I tried it and it worked WONDERFULLY! This is the most fun in baking that I’ve had in a long time thanks to your awesome dough recipe. I even let my toddlers make cookies and it was awesome. We made the cutest “snail” cookies. Thanks! This is our “go-to” recipe at Fancy Flours because it always bakes beautifully AND is delicious to boot. Even the most intricately cut cookies will hold their shape. We LOVE, LOVE, LOVE this recipe! Yes, you can use this recipe–I think the cookies you want to make require that you color a portion of the dough so that you have contrasting colors. I searched “snowflake cookie cutter” on the fancy flours web site and I do not see one with the cutouts like that pictured with the “No Fail Sugar Cookie Recipe” wordpress–is this particular one discontinued? I like it because it is simple and yet intricate. I think I, a novice, could decorate this particular cookie (as you did) with just frosting, edible glitter, and ivory pearls and look like a pro. Please help. Hi Linda – Unfortunately we do not carry this snowflake cutter, but we do have others that might work for you. There is the beautiful Giant Snowflake Cookie Cutter that has intricate cut outs, but would still be easy to make and decorate! Or there is this Snowflake Cutter that is a little less intricate and looks a lot like the one you mentioned. Hope that helps! If you have any other questions or comments, let us know! I just have to share this recipe. We’ve used this recipe for “No-fail” Sugar Cookies and it’s fabulous. Try it and let me know what you think. Or better yet, make some and I’ll sample yours….just for testing purposes of course! Can I refrigerate/freeze this dough to use later in the week? Hi Melanie – Yes, you can refrigerate or freeze our No Fail Sugar Cookie dough. Let us know if you have any other questions! Glad our recipe worked well for you Tiffany! Great taste! Held its shape! Is this self raising flour or plain?